A psychological drama set in a mental hospital on an isolated island off the coast of Boston, Shutter Island mixes a few too many ingredients. The meal is good, but spices compete for attention before the emergence of a dominant flavour. It's 1954, and US Marshals Edward Daniels (Leonardo DiCaprio) and Chuck Aule (Mark Ruffalo) travel to an island prison facility for severely disturbed mental patients to search for an escaped convict: Rachel Solando is convicted of drowning her three children, and was living in an alternate reality until she vanished. The prison is run by Dr. John Cawley (Ben Kingsley), who is experimenting with new treatment techniques and drugs that are more respectful than the brutal, traditional methods of dealing with mental patients. Edward and Chuck get the uneasy sense that Dr. Cawley and his team are being less than straightforward with their investigation of Solando's disappearance. Edward starts to experience headaches, and his health is not helped by flashbacks to his war experiences and the agony of his wife's death in a car crash. As a violent storm isolates the island, Edward has to try and separate truth from fiction in a dangerous environment where little is as it seems. Shutter Island is one of director Martin Scorsese's less focused efforts, but still provides several moments of compelling drama. Especially in its first half, Shutter Island bounces around several themes. It spends time as a criminal drama: Edward and Chuck looking for an escaped convict. tries it's hand at probing controversial science: is Dr. Cawley doing more good or more harm with his unconventional methods. It takes a turn into Edward's head, as his past World War Two experiences and personal family tragedy intrude on his focus. Undertones of escaped Nazi scientists continuing their evil deeds on US soil are introduced. And horror elements creep in, as Edward explores the island cemetery and the mysterious wing where the most violent mental patients are locked-up, and ghoulish characters jump out of the shadows. Despite the meandering, Shutter Island maintains the attention thanks to DiCaprio's intense, tortured magnetism and Scorsese succeeding in creating a canvass of ominous doom on the storm-battered island. After the movie's central twist becomes evident at the start of the second half, Shutter Island settles down to a more straightforward psychological drama, with the focus shifting to Edward's struggle against a wide range of demons from his past and present. 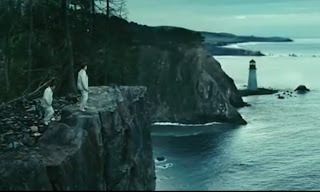 It does not quite hit its intended targets, but Shutter Island is a worthwhile destination.